The most important reason for all of us to strive for a healthy weight is to live as long and as healthy a life as possible. While it is nice to look good in a bathing suit, we at the Weight Loss Counter Revolution are primarily concerned with your health. With that said, we have to define what a healthy weight is. The medical and scientific community have all agreed on a healthy weight based on your body mass index (aka the BMI). I explain this in the Weight Loss Counter Revolution book. Simply, the BMI accounts for the contribution of your height to your weight. Everyone agrees that a BMI of 22-23 is ideal, a BMI of 25-30 is overweight and a BMI of >30 is obese. But where did they come up with these numbers? Did a group of scientists pick them out of a hat? Did they use a survey? Was it based on a collection of opinion? Of course not. 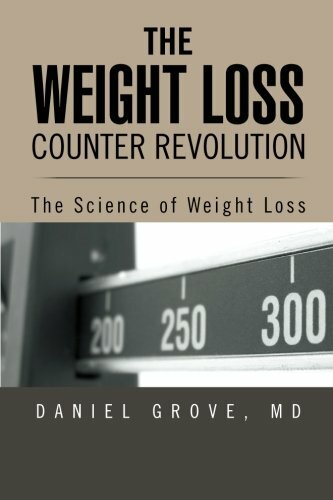 In the Weight Loss Counter Revolution book, all the details are given to explain how the medical community came up with these numbers. For the purpose of brevity, I will give you one of the biggest studies on the topic. A study in The Lancet (Lancet 2009; 373: 1083–96) combined the data from over 57 separate studies to create a collection of over 900,000 individuals. They were trying to see the relationship between BMI and the risk of dying. Their results are shown in the graph below. The bottom line on the graph is the BMI ranging from 15 to 50. The left side is the number of deaths per year per 1000 patients. What you see displayed is what they call a ‘J’ shaped curve. As your BMI goes down (i.e. you get too skinny) and as your BMI goes up (i.e. you get too fat) the number of deaths increases. What you’ll notice is the the bottom of the ‘J’ falles somewhere around 23. This means that your chance of dying is lowest with a BMI of 23. That’s why the ideal body weight is at a BMI of 23. It’s not because you look good at that weight (although you might). It’s not a guess. It’s not opinion. This is the point where the contribution of your weight to your risk of dying is the lowest. You’ll also notice that the risk of dying starts to increase right at a BMI of 25 (although the difference there is within the statistical margin of error). As the BMI increases and approaches 30, however, it is clear that the risk of dying is increased and continues to increase from that point on. That is the reason why someone with a BMI of 25 is considered overweight and someone with a BMI of 30 is considered obese. It’s all because of your risk of dying and has nothing to do with guesswork or opinion. It is a known fact. Similar graphs have been found showing your risk of devloping diabetes, heart disease, stroke, etc also increase with the same inflection points. There is a single group of people for whom the BMI does not really apply and that is athletes and people who are heavy weightlifters. 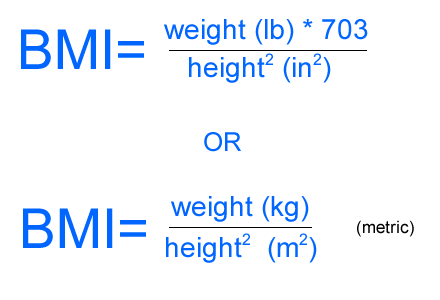 Many people try to claim that the BMI is not accurate based on the fact that muscle weighs more than fat. The funny thing to me is that, athletes and heavy weightlifters are not concerned about being overweight so they never ask me this question. They know they are in good shape. The people who ask this question are the overweight and obese people who looking for an excuse to say that they are not really that overweight – that the BMI calculations are cruelly biased agaisnt them. If you are accusing the BMI of being innacurate that only means that it applies to you MORE. And for those of you “big boned” people out there – this is a myth. Differences in bone size and density in no way contributes to the BMI calculations. The reality is that the BMI numbers are based on studies including MILLIONS of individuals from around the world. These individuals had a broad range of activity level, bone density, genetic make ups. The size of the sample is enough to prevent any biases based on these issues. The numbers are real, consistent, and not subject to legitimate dispute. The bottom line is that a healthy weight clearly corresponds to a BMI between 20 and 25. Between 25 and 30 you probably have an increased chance of dying. 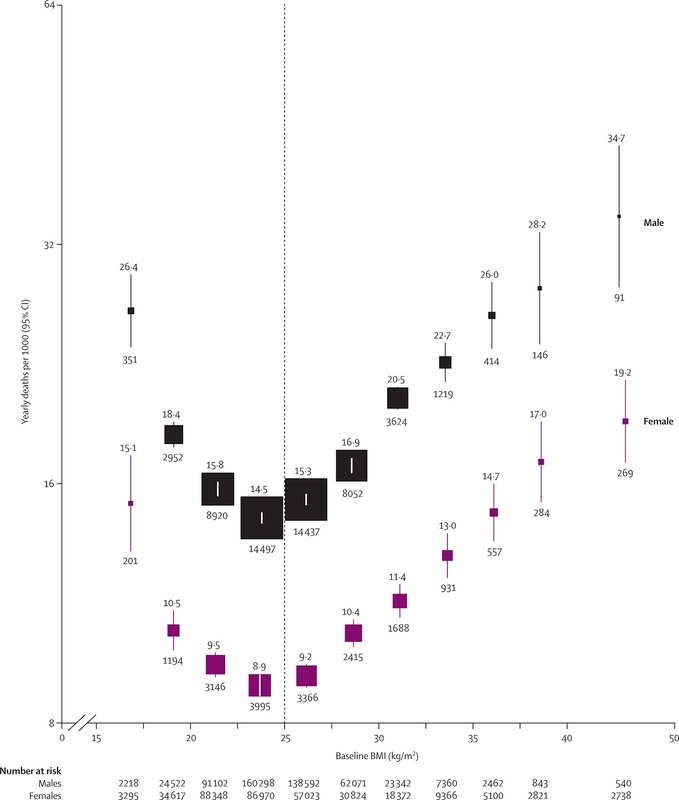 If your BMI is 30, you clearly have an increased risk of dying and are at an unhealthy weight. All this is explained in more detail and with more evidence in The Weight Loss Counter Revolution book. ← What about your diet? I just found your blog and I love it! Thank you. I have gotten absolutely no work done for like 2 days because I’ve been reading it. That said, the BMI is my nemesis – I hate it. HATE. IT. I know you are right…but I have to admit, I really wanted to believe all of the hype out there that says that it is not necessarily accurate. But I can’t argue with those numbers, even though I’d like to. Blurg. When I started losing weight about a year and a half ago, I weighed nearly 300 pounds and my BMI was 48.1. Now, it is 26.6. I thought I was almost there…I only have 10 pounds to go before I am at 25 whahoo! …and the last 15 pounds have been incredibly difficult to take off – it is going to be a long slog to my goal. And now it looks like I should probably readjust my goal down another 10-15 pounds. Not that I plan to change anything about my new lifestyle when I reach my goal…It will just feel good to reach it. I’ve been overweight or obese since I was 18 (21 years…) though, so it’ll be worth it. Anyway, thanks for your blog. I’m trying to learn as much as I can about nutrition, health, diet, etc. so that I don’t join the ranks of those who lose a lot of weight and gain it all back, and the information you provide is incredibly useful, even when it is hard to read. Congratulations on your success thus far! Before you get too downtrodden about not getting below 25 you should read a more recent post with some new information (https://weightlosscounterrevolution.com/2013/01/03/is-being-overweight-a-good-thing/). The nice thing about this blog is that I am constantly updating it as new research comes out. If you’d like to better understand how your body works with respect to weight check out my book. You can buy it from the publisher by clicking the link at the top right of the page.